In 2008, I was diagnosed with Mitral Valve Prolapse. It’s a heart condition where one of the valves in the middle of the heart doesn’t work the way it should. Instead of opening and closing to allow blood to flow from the different sides of the heart, it snaps backwards and overextends. Sometimes this can lead to blood leaking through the valve when it shouldn’t. But it always causes a vibration in the heart as the valve snaps against the back wall of the heart. It is not life threatening, but can be extremely alarming to the person who has it in the symptoms it produces. I first found out I had this because during one of my pregnancies in 2008, I started having irregular heart rhythms. I was sent to a cardiologist and they said I had Mitral Valve Prolapse. There is no leaking in my valve so they decided I didn’t need any interventions at that time. The irregular heart rhythm continued and was annoying, but I could live with it. Unfortunately, that pregnancy ended in miscarriage. The irregular heart rhythm continued even after the pregnancy ended. 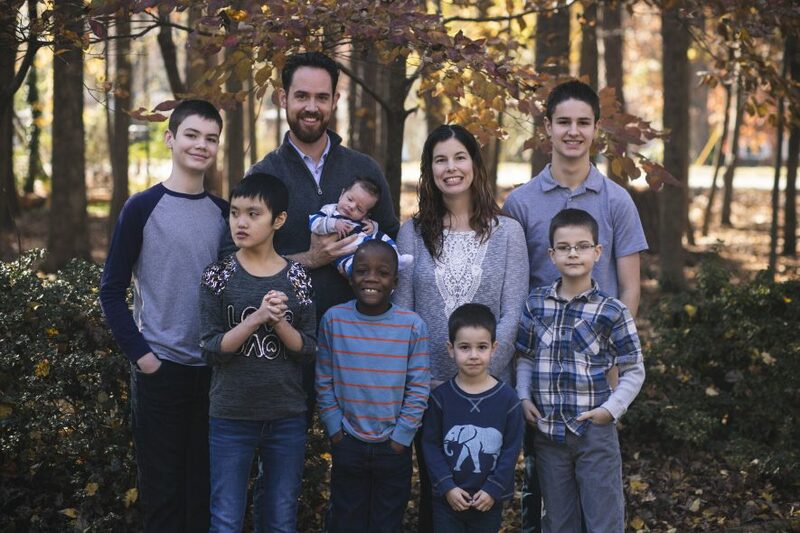 When I got pregnant in 2010 with my son Elijah I was concerned about the Mitral Valve Prolapse( MVP) becoming worse during that pregnancy, so I was monitored by the cardiologist again. He said that MVP usually gets better with pregnancy due to increased blood flow and he wasn’t sure why I had trouble with it during the last pregnancy. I think it had something to do with the pregnancy being troubled, but that is just my theory. Anyway, I felt better than ever had while pregnant with Elijah and had no trouble with it during delivery either. I was very relieved. Once, when I was doing research about MVP, I read that people who have it, have a 40% chance of having anxiety as well, due to the changes it produces in your nervous system. I didn’t think much about it at the time, even though I had be diagnosed with anxiety years before. Fast forward to October of 2012, we were waiting to bring our daughter home from Hong Kong. It was a very stressful time and one Sunday morning I was standing in church and had what I later realized was a panic attack. I felt better the next day so I didn’t think much about it. I continued to have shortness of breath, irregular heart rhythm and some other symptoms off and on for the next couple months until we brought Elizabeth home and then I felt better. I figured it was just stress and I mentioned it to my cardiologist and he said it was stress. Everything was fine until two weeks ago when I woke up with the same symptoms. The next day I was still having symptoms and went to the urgent care near my house. They said I was anemic and told me to follow-up with my regular doctor. I did, and they also said I was anemic and it was stress, and put me on iron pills. I started to look back at my lab results for the past few years and realized I had been anemic for years, not really anemic but just slightly. So, I wondered why I started having these symptoms now when I had been anemic in the past? I started doing some research about MVP. What I found was that some people have it and have no symptoms at all while others have very debilitating symptoms for years. It can be effected by stress and illness. I have had both recently. So, I started exercising, walking two miles a day, drinking more water, cut out caffeine and cut down on sugar and I feel better than I have in a while. I am still going to see my cardiologist this week to confirm there is nothing else wrong, but I think I have found my issue. I realized through all this I have to take better care of myself or I won’t be able to function. I assumed I could just eat whatever I wanted and not excercise and I would be fine. Moms have this mentality that everyone else in their care deserves more than they do. I always put myself last. That’s what good mom’s do right? It’s a fine line between being a servant to your family and not taking care of yourself. God calls us to be servants to others, but he also says to honor your body. As a mom you have to eat well and take care of yourself or you will suffer for it in your health and then you will be no good to anyone. I have realized I have to take time to exercise and to de-stress my life. We will be making some changes to our lifestyle to make things less stressful. We had already been led that way in prayer, but this heath issue showed me just how important it is. Cutting out stress from your life might look different for different people, because we are all different. Something that is stressful for me might not be stressful for you. The point is we cannot do for God what he would have us do if we don’t take care of ourselves in the process. God doesn’t want us to be stressed out. So, if you are stressed about something, you either have to cut that out of your life or learn a new way to look at the situation. Maybe you are worrying unnecessarily. Sometimes we cannot change our situation, but we must change our outlook on the situation. Do at least one thing today to take care of yourself. Please don’t wait until a health crisis hits you to makes changes. Good message. Thankful that I have learned this lesson…but, of course, it involved years in bed because of the pain and fatigue of fibromyalgia. Praying for you as you pursue better things for yourself! Wow! I had no idea that you also had this heart condition. At age 29, after eating right, exercising, and losing 65 pounds, I was admitted to the hospital and treated for a heart attack. My blood pressure was through the roof. Only after additional tests and an overnight stay did the doctors realize I had not actually had a heart attack. My doctors at that time did not have a name for what was going on with my heart, but noted it was damaged. I was making every effort to take care of myself physically, but mentally, emotionally, and spiritually I was undone. I had been diagnosed with anxiety disorder and had fought high blood pressure since my early 20s, but all of that was under control…or so I thought. I had no idea at the time, how my mental, emotional and spiritual health could affect me physically. It wasn’t until I was well into my 30s that I received the MVP diagnosis. While I appreciate having a name for the condition, I know that I have to take care of myself. As a mommy with a career outside the home, this requires overcoming much working mommy guilt. What I have learned is that it is impossible for me to be a great mom & wife if I don’t give proper attention to EVERY part of me. It’s not selfish. It’s a gift to my family when I take care of me.